Helen Alice Kinnear was born in the small southern Ontario community of Cayuga, Haldimand County, on the Niagara Peninsula, May 6, 1894. She was the daughter of Louis Kinnear and Elizabeth Eleanor Thompson and one of four children. A serious and successful student, she received her early education in Port Colborne where her father practised law. After completing her secondary education in Welland, she attended the University of Toronto where she graduated in 1917, with an honours degree in English and history. Following in her father's footsteps she decided to embark upon a legal career and entered studies at Osgoode Hall Law School. By the time that she had completed her first year, she had already won one scholarship and when she was called to the Bar in October 1920, she did so with honours. Immediately after her call, Helen joined her father's law firm making her the first woman on the Niagara Peninsula to practise law. After her father's death in 1924, she continued the general law practice he had established. At the time that Helen Kinnear made her legal debut, the profession was dominated by men. She ignored the gender barriers that confronted her and shattered the stereotypes that prevailed in the legal profession. In doing so, she broke new ground and became a role model for those who would follow her. She became the first woman to argue a case before both the Supreme Court of Ontario and the Supreme Court of Canada and in 1934, she became the first woman in the British Empire to become a King's Counsel. In 1943. Helen Kinnear made legal history once again by becoming the first federally appointed female judge in Canada when she accepted an appointment to the County Bench in Haldimand. When she was sworn in at the County Courthouse, her success was celebrated by members of the Women's Law Association of Ontario who travelled to Cayuga to witness the ceremony and also honoured her achievement by giving a dinner for her at the Toronto University Women's Club. Although a dedicated member of the legal profession, Helen Kinnear also took an active interest in politics. She served as the President of the Welland County Liberal Association from 1938 to 1940 and won the Liberal nomination for the county in 1941. However, women in politics were still a rarity at this time and so it was determined that in the best interest of the party, Helen should step aside to allow Humphrey Mitchell, the newly appointed Minister of Labour, to run in a by-election. Helen Kinnear later commented that "it was a hard decision to make, especially in view of the fact that the women of Canada had worked for 20 years with little success in gaining representation in Ottawa." With her political career stalled, Justice Kinnear decided to concentrate her full attention on her interest in juvenile and family law issues, as well as the treatment of prisoners with diminished legal capacities by spending the majority of her time serving on the Bench of the Juvenile and Family Courts. She also became the honorary President of the Haldimand Children's Aid Society in 1946 and the first President of the Juvenile and Family Court Judges Association of Ontario from 1952 to 1954. On March 2, 1954, she was appointed to a royal commission into criminal law relating to the defence of the insane. Later that month, she was appointed to a second royal commission, this one involved in amending the law on criminal sexual psychopaths. In 1965, two years after she retired and returned to live in Port Colborne, Justice Kinnear became the first woman to receive a medal from the John Howard Society of Ontario. The citation read at the ceremony cited her as having provided "distinguished humanitarian service. Helen Kinnear died in 1970 at the Port Colborne General Hospital. On March 8, 1993, International Women's Day - Canada Post introduced four stamps honouring Canadian women of achievement. Among them was Judge Helen Kinnear. Until 1952, Ontario women were not legally allowed to sit on juries. 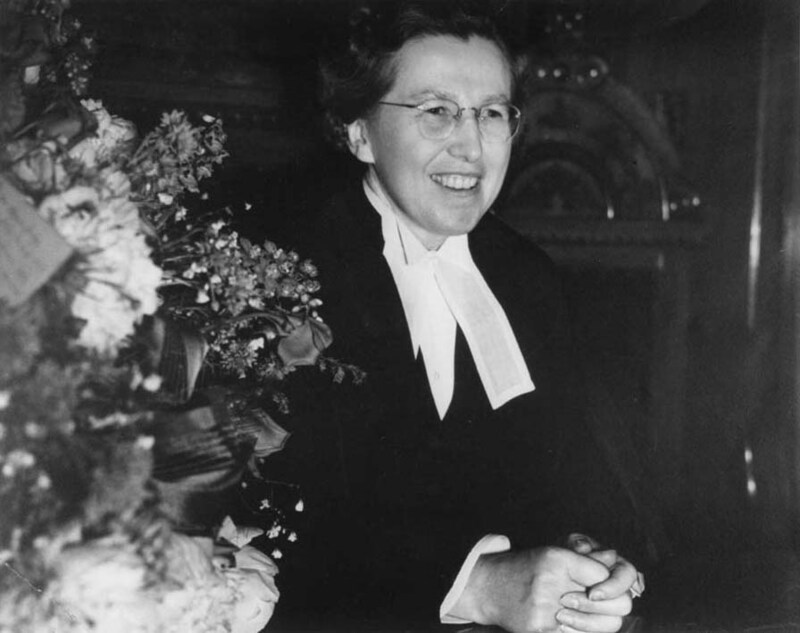 When the Ontario Jurors Act made them eligible, Helen Kinnear was Canada's only female judge. A reporter asked her what she thought of women sitting on juries. "Why not?" she replied. "I had to pick out the names of men for jury duty for nine years. I got a bit tired of it."